The Hackney Coffee Company has only been in business for a couple of years, housed in a family-owned premises that has over the years seen service as a garage, depot and even brewery before entering the world of coffee. 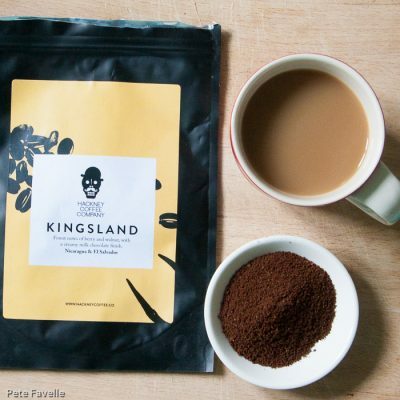 Their coffee blends are all named for local landmarks or history, which certainly helps root them to their Hackney home. Kingsland is Hackney’s mainstay espresso coffee blend, a South American mix taking in beans from El Salvador and Nicaragua. The name comes from “King’s Land”, which was the name used for the ancient forests of Hackney where royalty and nobility would ride out of London to hunt. It’s hard to imagine wild boar and deer roaming the streets of Hackney these days, but it’s easy to forget just how much of what we think of as “London” was positively rural in the surprisingly recent past. The grounds have a positively creamy aroma; dulce de leche with old wood and, over time, a hint of milk chocolate. Brewed, the creaminess is mostly lost and it becomes more toffee-like. At the same time, a lemon juice acidity starts to appear. In the mouth the creaminess is back; smooth milk chocolate and just a touch of raspberry, and little in the way of bitterness present. The finish certainly has a tannic dryness to it, but it’s well restrained. There’s a richness to the flavour, but without being exactly strong – while I’m not sure it’s powerful enough to be a traditional espresso, it fits my style of coffee very well. An excellent coffee, and deserving of 4 stars. Many thanks to Hackney Coffee for providing samples to Pete Drinks.